I'm a little torn on this one. On the one hand, I felt like the various interviews were interesting, and I liked getting other reader's perspectives. Some of the personal stories were very powerful, esp. those who wrote about their children coming out, being bullied, etc. The connections made through m/m romance can be very strong and it was great to see that my circle of friends is not the only group that has experienced the same thing.However, I was expecting something a bit more academic. I know that there are studies of all kinds out there- hasn't anyone looked into this topic yet? 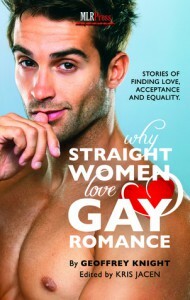 I attended some presentations at a popular culture academic conference this year and there are studies on everything, people studying all sorts of minutia, so I find it hard to believe that there aren't people in academic settings looking into the question of what draws straight women to gay romances.Basically, I wanted to have a higher level view because I have spoken to a lot of women on a one-on-one level as a slash reader and writer for years- I was hoping for a bit more than what I've already read.I felt like there were opportunities to dig into some of the respondents answers that were missed or ignored by the author, which was disappointing for sure.This is a great idea but I would love to see it taken further.Also, I felt like it was a bit unfair that the actual interview portion of the book ends at roughly 80% of the book (I read it on Kindle so don't have an exact page number) and the rest of the book was a bit of fiction that I didn't really care for. I paid for this book and I wanted it to be ALL about women reading gay romance- I didn't buy it for an actual gay romance story. Maybe I'm just picky but it actually kind of pissed me off.YMMV.